This small plaque appears originally to have been made for use as a buckle from the drilled hole at the upper centre section, in conjunction with the sculpted horizontal opening in the lower section, both of which have been integrated in the composition of the decoration. The main design of two seated lions in profile recalls the pairs of monumental stone lion sculptures which were erected as guardians of ancient Tibetan tombs of the royalty and aristocracy . Due to this buckle’s evident history of use, it is all the more fascinating to examine the decorative motifs which may help us understand its function. The design is symmetrical, divided by a central vertical rectangle. It includes two confronted male lions, seated in profile on lotus pedestals with wide rounded petals. The lions crouch on their hind-legs, their tails raised behind them. Their faces are very simply rendered in three-quarter profile. The manes have rounded curls. Each lion is also surrounded by a large flower with a central pistil that touches the mane, the stem winding towards the lotus pedestal, as does the stem of a second flower beneath the lion. Above the lions are symmetrical scrolling designs of indistinct honeysuckle floret shapes, filling the space of the belt buckle form . This buckle is solid cast; the back is uncarved but is polished for smoothness. The design of confronted animals in profile recalls the outline of motifs found in Central Asian and Sichuan silks excavated from Tibetan tombs in the Kokonor region, where similar designs were also found on silver vessels . Although no brass objects have yet been excavated there to my knowledge, a date contemporary with these tombs is suggested. The size of the buckle is relatively large for a belt, while the hole through which a leather or fabric belt would pass is very small. The lion in Tibet at this period was a symbol of the Buddha as well as of the authority of the Tibetan sovereigns, and the lotus pedestals which support these lions would seem to indicate a Buddhist context. 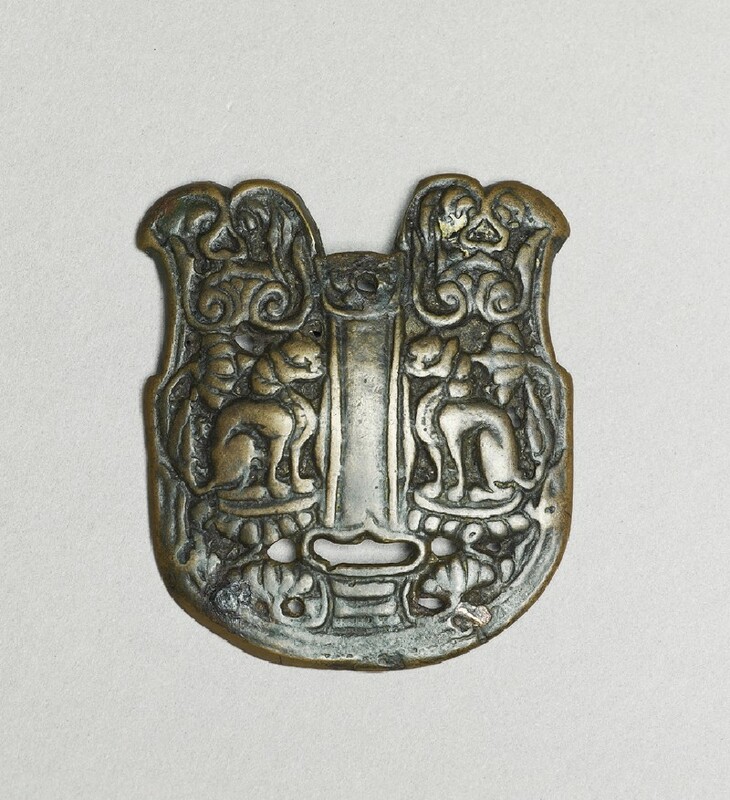 This lion buckle may therefore have been designed not for wearing on the body, unless perhaps as a fixture to a purse worn at the waist , but rather to tie the string or silk ribbons which retain the loose leaves of volumes of Tibetan Buddhist scriptures. 1 See Introduction, fig. 13, above; and Richardson, High Peaks, Pure Earth, pl. 7. 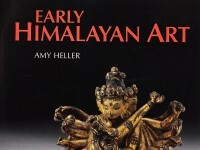 2 See the textile with confronted honeysuckle designs excavated from a Tibetan tomb, in Heller, ‘Some preliminary remarks on the excavations at Dulan’, fig. 18. 3 Watt and Wardwell, When Silk was Gold, pls. 3, 5; see also Heller, ‘An eighth-century child’s garment of Sogdian and Chinese silks’. 4 I am indebted to the late Boris Marshak for this suggestion.